Solar thermal systems utilize radiation from the sun to produce heat. This heat can be used to produce steam for process applications or to drive a turbine and produce electricity. The solar heat may also be used to produce cooling/air-conditioning, using a heat driven (absorption) refrigeration system. Solar thermal energy represents a huge energy resource that can be tapped cost-effectively, and there is a growing interest in using this resource because it produces no greenhouse gas emissions. 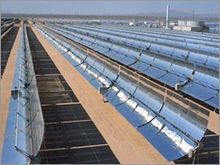 A the heart of our solar combined heat and power system is the parabolic trough solar collector. Parabolic trough collectors use curved, mirrored trough to reflect sunlight onto a receiver pipe running the length of the trough. They can focus the sun at up to 80 times its normal intensity. A heat transfer fluid, usually oil, flows through the pipe and become heated. This fluid is then routed through heat exchangers to generate steam and/or to drive a steam turbine and generate electricity. Solar thermal power plants, using parabolic troughs collectors, are one of the lowest cost solar power technology available today. The cost of electricity from these power plants is approximately $0.10 to $0.12 per kWh, and with improvements, is expected to drop to $0.04 to $0.05 per kWh. We provide (a) project engineering feasibility studies, (b) equipment procurement and (c) system construction and commissioning. Solar thermal power plants can provide continuous power (day or night) through the integration of thermal energy storage. In our design, a thermal energy storage module is developed to allows solar thermal energy (collected during the day) to be used to provide heat and/or electricity during the evenings and summer peak hours. The thermal storage system uses a two tank system in which heat from the Parabolic Trough system is stored in a "Hot Tank". When heat is required, the heat transfer fluid is pumped from the hot tank to the cold tank, through the steam generator and a low temperature heat exchanger.